If you’re wondering how to remain competitive in a post-DARPA DEFCON CTF, I highly recommend you take a look at Binary Ninja. Before I share how I slashed through the three challenges — 334 cuts, 666 cuts, and 1,000 cuts — I have to acknowledge the tool that made my work possible. 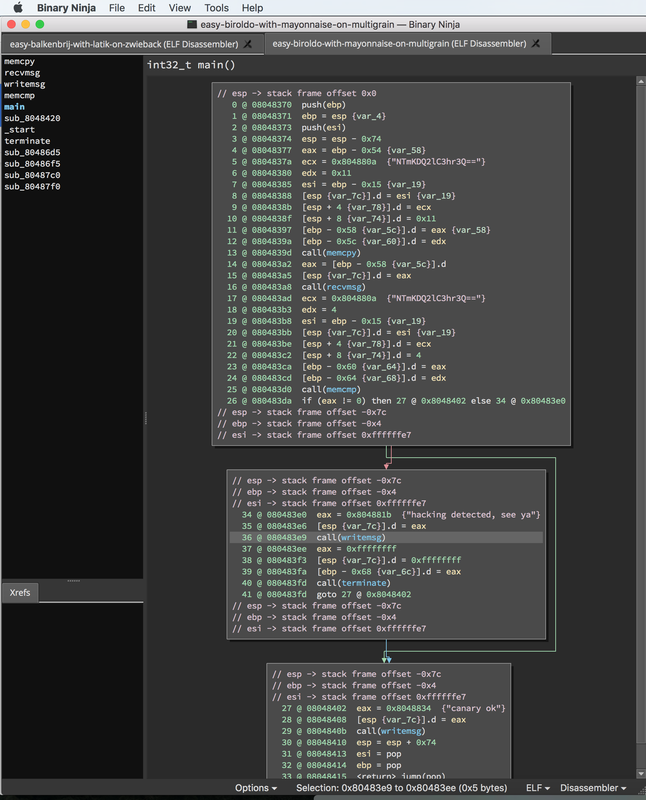 Compared to my experience with IDA, which is held together with duct tape and prayers, Binary Ninja’s workflow is a pleasure. It does analysis on its own intermediate language (IL), which is exposed through Python and C++ APIs. 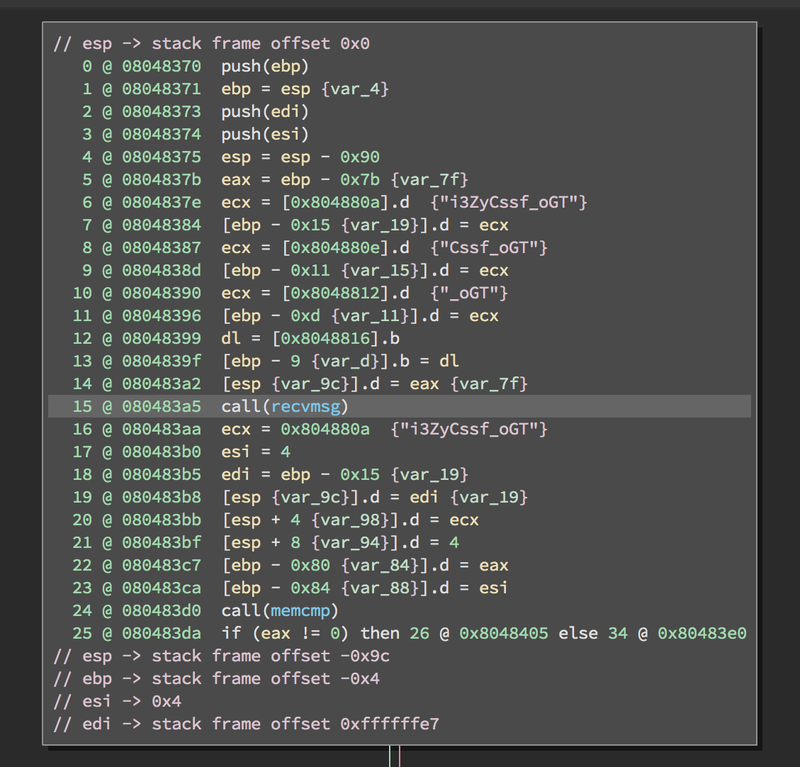 It’s comparatively simple to query blocks of code, functions, trace execution flow, query register states, and many other tasks that seem herculean within IDA. This brought a welcome distraction from the slew of stack-based buffer overflows and unhardened heap exploitation that have come to characterize DEFCON’s CTF. Use IDA and IDAPython; a more expensive and unpleasant proposition. Develop a Cyber Reasoning System; an unrealistic option for most participants. Reverse the binaries by hand; effectively impossible given the number of binaries. None of these are nearly as attractive as Binary Ninja. This year’s qualifying challenges were heavily focused on preparing competitors for the Cyber Grand Challenge (CGC). A full third of the challenges were DECREE-based. Several required CGC-style “Proof of Vulnerability” exploits. This year the finals will be based on DECREE so the winning CGC robot can ‘play’ against the human competitors. For the first time in its history, DEFCON CTF is abandoning the attack-defense model. Okay, so it wants us to crash the service, no problem; I already had a crashing input string for that service already from a previous challenge. I wasn’t expecting a second challenge name after the first. I’m guessing I’m going to need to crash a few services now. Next I extracted the tarball. Hmm, there are 334 DECREE challenge binaries, all with food-related names. Well, time to throw them into Binja. Starting with easy-biroldo-with-mayonnaise-on-multigrain. DECREE challenge binaries are secretly ELF binaries (as used on Linux and FreeBSD), so they load just fine with Binja’s ELF loader. Our crashing string has to exactly overflow both the stack buffer and pass the canary check in each of the 334 binaries. It’s best to automate collecting this information. Thankfully Binja can be used as a headless analysis engine from Python! We start by importing binja into our python script and creating a binary view. The binary view is our main interface to Binja’s analysis. I was initially trying to create a generic solution without looking at the majority of the challenge binaries, so I found the main function programmatically. I did that by starting at the entry point and knowing that it made two calls. From the entry point, I knew there were two calls with the second being the one I wanted. Similarly, I knew the next function had one call and the call was the one I wanted to follow to main. All my analysis used Binja’s LowLevelIL. Once we have our reference to main, the real fun begins. Then I knew that the first call was to a memcpy, the second was to recvmsg, and the third was to the canary memcmp. Small hiccup here, sometimes the compiler would inline the memcpy. This happened when the canary string string was less than 16 bytes long. To extract the canary and size of the canary buffer, I used the newly introduced get_parameter_at() function. This function is fantastic: at any caller site, it allows you to query the function parameters with respect to calling convention and system architecture. I used it to query all the parameters for the call to memcmp. Next I need to know how big the buffer to overflow is. To do this, I once again used get_parameter_at() to query the first argument for the read_buf call. This points to the stack buffer we’ll overflow. We can calculate its size by subtracting the offset of the canary’s stack buffer. It turns out the other two variables were inconsequential. These two bits of information were all we needed to craft our crashing string. I glued all this logic together and threw it at the 334 challenge. It prompted me for 10 crashing strings before giving me the flag: baby's first crs cirvyudta. I’m expecting 666 challenge binaries. Same game as before, I throw a random binary into binja and it’s nearly identical to the set from 334. At this point I wonder if the same script will work for this challenge. I modify it to connect to the new service and run it. The new service provides 10 challenge binary names to crash and my script provides 10 crashing strings, before printing the flag: you think this is the real quaid DeifCokIj. You get the idea, 1000 challenges, same script, flag is: do you want a thousand bandages gruanfir3. Binary Ninja shows a lot of promise, but it still has a ways to go. In future versions I hope to see the addition of SSA and a flexible type system. Once SSA is added to Binary Ninja, it will be easier to identify data flows through the application, tell when types change, and determine when stack slots are reused. It’s also a foundational feature that helps build a decompiler. 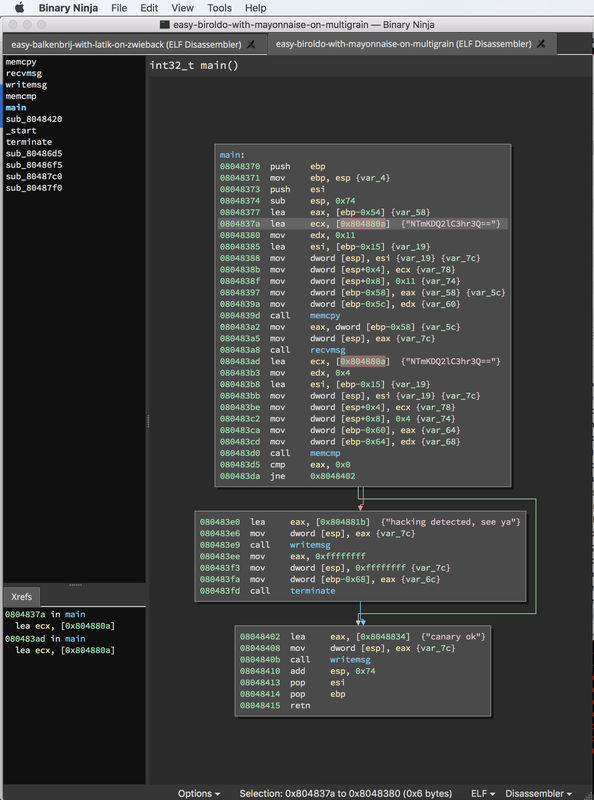 From its silky smooth graph view to its intermediate language to its smart integration with Python, Binary Ninja provides a fantastic interface for static binary analysis. With minimal effort, it allowed me to extract data from 2000 binaries quickly and easily. That’s the bigger story here: It’s possible to enhance our capabilities and combine mechanical efficiency with human intuition. In fact, I’d say it’s preferable. We’re not going to become more secure if we rely on machines entirely. Instead, we should focus on building tools that make us more effective; tools like Binary Ninja. If you agree, give Binary Ninja a chance. In less than a year of development, it’s already punching above its weight class. Expect more fanboyism from myself and the rest of Trail of Bits — especially as Binary Ninja continues to improve. My (slightly updated) script is available here. For the sake of history, the original is available here. Binary Ninja is currently in a private beta and has a public Slack. Update (25 August 2016): Binary Ninja is now publicly available in two flavors: commercial ($399) and personal ($99). The script presented here uses the “GUI-less processing” feature that’s only available in the commercial edition. Great post, thanks! Are the binary files from 334 cuts, 666 cuts, and 1,000 cuts challenges available online anywhere? (the link you gave no longer has the bins), would be great if you could upload them, thanks!